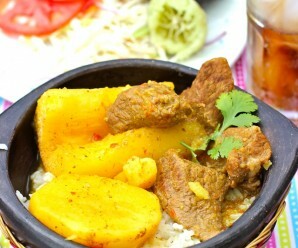 Anyone who is a fan of Colombian cuisine has probably tried the famous “Hogao“, a Colombian Creole Sauce. It’s on virtually every menu of Colombian restaurants around the world. 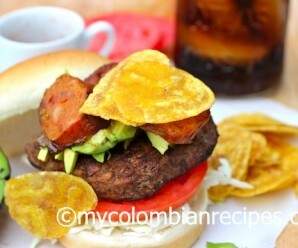 The ingredients may vary slightly, depending on the Colombian region of origin of the Hogao. 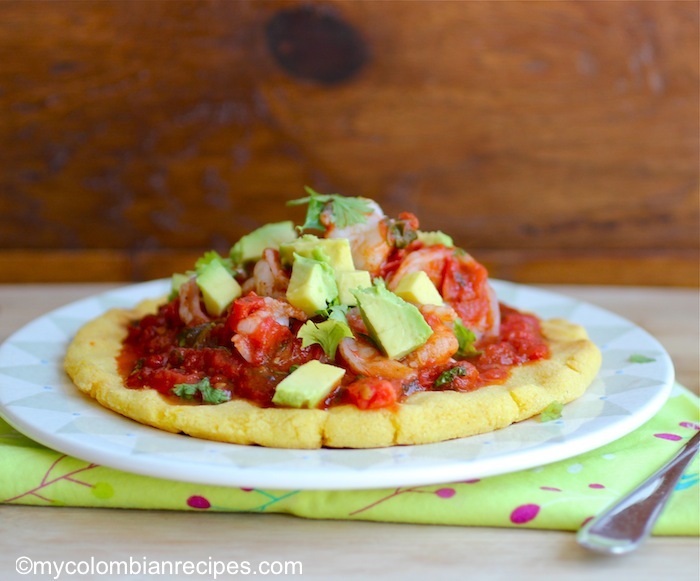 Arepas con Camarones y Hogao or Shrimp and Creole Sauce are a popular topping to arepas in Colombia. I hope you enjoy this dish as much as I do! Season the shrimp with salt and pepper. In a small pot place the hogao and shrimp. Stir and cook, stirring frequently, until the shrimp are pink and opaque, about 2 minutes. 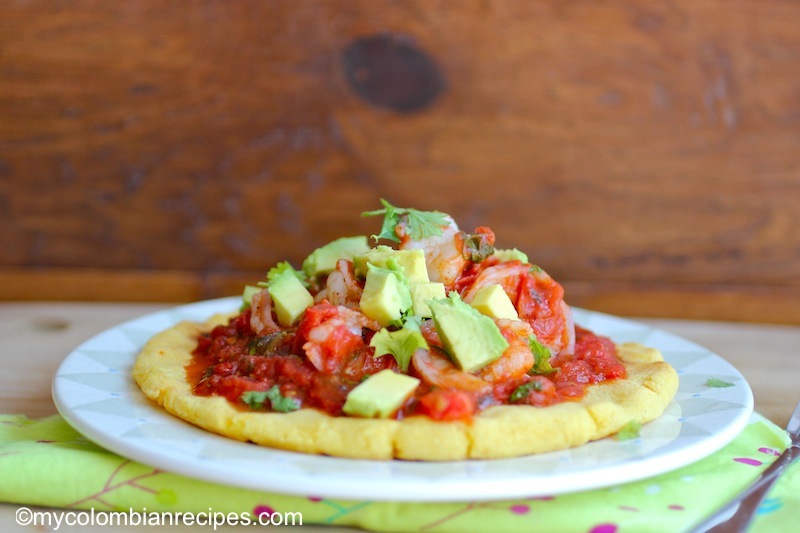 Top the arepas with the hogao-shrimp mixture. Sprinkle fresh cilantro and serve. Quisiera preguntarte como se consigue la carne para hacer sobrebarriga? compre algo llamado skirt pensando que era eso y no. Pero ya vi, la receta para el almuerzo. Muchas gracias por tu inspiracion!! 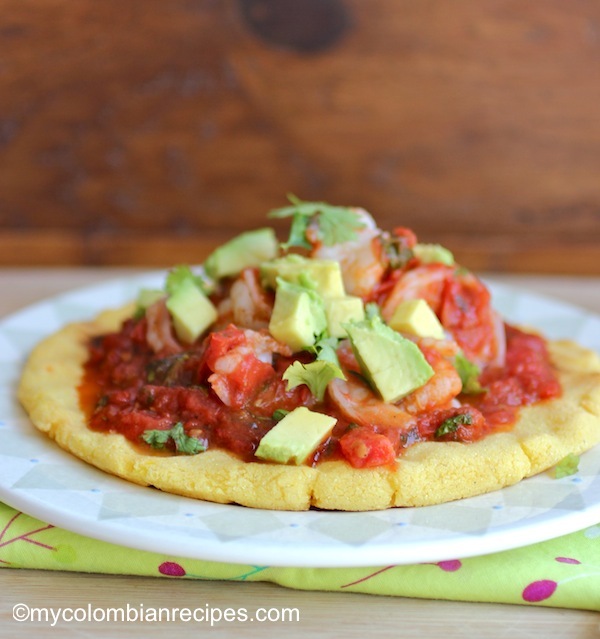 y por mantener esta pagina con cocina colombiana..ojala tuviera olores incluidos!! Un abrazo y saludos a tus bebes. What a beautiful dish! It sounds like a super flavorful sauce — yum! 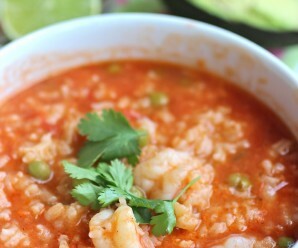 Erica, I love how you prepared this shrimps…they look delicious with the tomato sauce on top…and cilantro…yummie! The hogao sauce sounds incredibly flavorful, awesome with shrimp on arepas! Fantastic arepa. Love the complete flavor profile of the dish. Just found your site, look forward to following your kitchen adventures here. Uh, yeah!! The sauce…the arepas…the shrimp…this is one gorgeously composed dish, not to mention the perfect combination of flavors. What time is dinner? What a fantastic – and SIMPLE recipe – I am so thrilled to have the sauce in one post, the tortillas in another post. This is definitely an authentic recipe that looks DELICIOUS and that I can actually make it an understand it. Thank you! I have missed you! OMG, this looks amazing as always, what a tremendously tasty looking dish. Erika, I was born in Colombia too, and it has been a while since I tried an Hogao like the one you have in your Hogao sauce recipe. This one looks pretty good too! Thank you for your posts! 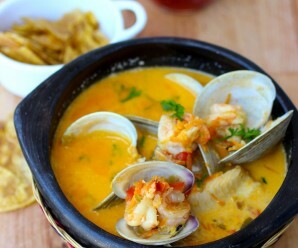 Have just discovered your website and the AMAZING Columbian recipes! We’re making the shrimp in Hogao for tonight’s dinner! I’ve been pinning your fantastic pictures and links to your recipes on my pinterest recipe board. Thanks for the great inspiration and share your love for your delicious culture. I would love to know how u make your hogao. Mine is delicious but sounds like yours is out of this world so please sen me yours. Here is my email addess: sheliaescobar1953@gmail.com. I will be awaiting patiently.